This is pure comfort food, in my book. Please keep in mind that I don't measure anything. Several people have suggested I write a cookbook, but that just makes me laugh because I don't use measurements. Just toss it all in. It'll work. In a large bowl, combine the soup, sour cream and seasonings. Add potatoes, cooked sausage and cheddar cheese; mix well. Pour into a greased 13x9 baking dish. Bake uncovered at 350 for 55-60 minutes. Yield 12-16 servings. Now I haven't tried it, but I'd imagine that this casserole would also work well in a slow cooker. Just mix it up, pop it in and cook it on low for several hours. Make it, eat it, and then promise yourself you'll start working out more often. i'm just kidding. about the mean part. i really don't have motivation. wanna come cook for me?? ok, fine. don't cook for me. pray for me? please? That looks yummy and sounds like my kind of simple, that's what i like! Thanks for sharing! I make one with ham that is very similar to this! Add a can of green chilis to it...YUMMY!! Ohhh I bet that's yummy! I LOVE green chilis. I have a similar recipe that's good but it doesn't have the sausage. Sounds like the missing, magic ingredient to me! Yum! Looks like some perfect, comforting soul food for this pregnant lady! Thanks for posting this, it looks fabulous! That looks delish--more, please, Beki, give us more like this. Easy cooking is my kinda cooking! Yummy in the tummy. 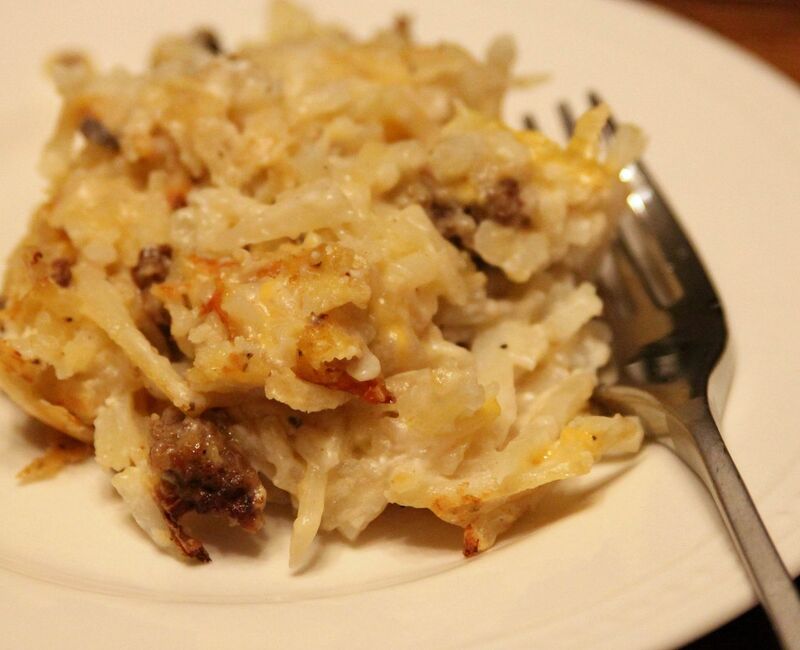 Love these breakfasty casseroles. I'll put a pound of sausage in for my man. He never thinks I use enough meat. More meat, less potatoes is his mantra. Mine is more potatoes, less meat. We're like Jack Spratt and his wife! i have made this often (and in fact, funny, have been craving this for days....now i am taking this as a sign to go make it for a mid day snack! ;)) But my recipe is sans sausage...but now the wheels are turning!!! wonder if some bacon would be yummy too?! (of course it would, bacon makes everything better!!!) Thanks for sharing!!! YUM!! This looks so good Beki! Will be on my list when winter rolls around. YUM! I make something just like this called Cheesey Potatoes. I am SO going to have to try this version =) Looks sooooo good! if i leave the pork out can i do less exercise? Just curious...do you serve anything WITH this? This looks scrumptious!!! I am going to be starting the p90x program soon like Sugarberry.. but I am not there yet he he. Mmmmmm. 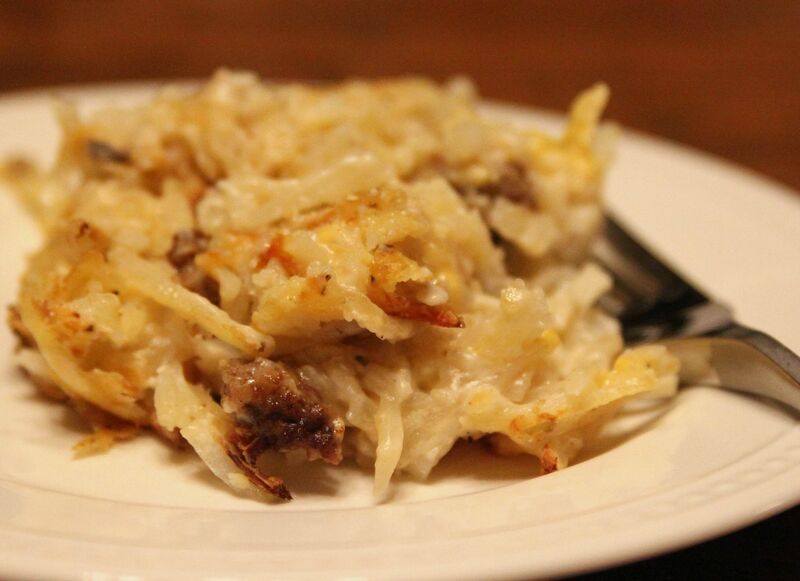 Two of my favorite foods - sausage AND hash browns. Goes without saying, cheese, too. sounds so YUMMY...will give it a try. Mmmmm.... this looks so yummy!